After the Grammys last night, many of you have requested that I get Corinne On the Couch. So, I'm reposting my interview from last fall for those that may have missed it! In the world of natural hair, there are tons of community and celebrity hair idols floating around. Folks whose hair we admire and appreciate even if ours is in no way similar. We want nothing more than to know their routine, their fave products, or 'how they got THAT look, in THAT picture'. 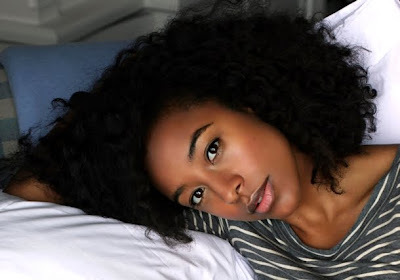 Corinne Bailey Rae, and I think you'd agree, is the definition of a Natural Hair Idol. When she and her amazing ringlets hit the scene in 2006, I remember feeling awe struck... to this day, I Google her images for twist-out inspiration. Well, good news divas! The British singer and songwriter is *finally* 'On the Couch' and telling all... even how at one point, she wanted to start a natural hair site! It was a challenge tracking her down but it was so worth it... she has a beautiful soul and I'm honored to deliver her story to you! Enjoy! I was natural until I was about 13 and then got my hair permed, weirdly. I didn't really look after my hair before that and didn't know that it would actually grow 'curly' on its own. So yeah, I had a perm, and when I was about 16, I had it relaxed because I had my hair cut really short. It was kinda like Indie... like a white boy's hair style [Laughter], because I was in this guitar band. It was really, really straight and I'd wear it off to the side. I remember, hoping it wouldn't grow... you know, so it'd stay sort of as it was when you just had it done (relaxed). That's very unhealthy... horrible even. So anyway, the summer before I went to University, a guy stopped me in the street and asked if I'd like to be a hair model for a project he was doing. I said yes, thinking at least I'd get a free relaxer out of it, because at the time, that was a really expensive process. So I did it, but the style was pretty extreme-- he dyed the tips of my hair red and cut it really short in the middle. It was this really ghastly hair style... a weird vampire theme. I remembered my friend's mother was getting married like 2 days after I had it done, and I said to the stylist, 'okay, I need you to do my hair before this wedding, because I have red tips... I've essentially got horns... I need it transformed back, relaxed and dyed back to black'. He claimed there wasn't enough time! Really? And this was the entire reason I did it (went natural). Just before that wedding, he basically cut my hair down to like an inch or two inches long, cut all the relaxer and hair dye out, and that was it. That was my style. So when I went to University, I had this natural hair style- like a tiny afro, really, really short hair- and I'd always wear jeans and a leather jacket and everyone thought I was a Black Panther. I quickly got used to it. I liked the fact that you could wash your hair regularly and I loved that my hair was curly. I had never noticed it before because I was always pulling it and combing it straight. Finally, I discovered this really good, moisturizing shampoo. I think they were giving away a shampoo at the time on the front of some magazine... Wella? So I had a whole load of those and I would wash my hair, get right to the scalp, comb it and then twist it a bit with moisturizing cream and just leave it. And it was a revelation to me that my hair had that kind of texture. And because it didn't have a lot of length, it curled really easily and I thought, I'm just gonna keep it like this. But of course, it just sort of grew out over time. I remember I used to twist the front and the rest would be in this baby afro and then as it got longer and longer, I'd wind it around my fingers to make more of ringletly type curls. These days, I've embraced the texture even more. What I do now is wash it, put the conditioner in and detangle it with a big paddle brush which takes 40 minutes... it takes a while. I do it from the ends to the roots and then I put it in 4 or so plaits-- I plait the front section and then one in the crown and two at the sides. I leave that for a day or a day and a half.... it has to be a day where you're just hanging out at home. When I take them down, it's in those loose kinks from the plaits, but it's still a bit wet, so then my natural curl kind of comes back in a bit and it's a combination between those kind of kinks and my normal curls. That's my staple style. That was the result of the plaits. You put them where you want them, in the direction you want your hair to go in... I personally like a side part. So yeah, you just make the big plaits and dry your hair in those. A lot of stylists tried drying my hair with a blow dryer, but it makes it straight. It's really weird, the heat pulls out the curl and flattens it. So generally, I just braid it up and let them dry. I do my own hair much of the time. But when I'm working, I have different stylists. I have one in London, he's brilliant actually. He's this White guy, the same age as me, British... his name is Kenna and he has this studio called KennaLand. I find that he has a real sort of fashion forward focus, and he's really into Afro hair. He does Emily Sande's hair, this girl that just came out, she has an awesome shaved, blonde height. He also does Shingai Shoniwa's hair. He loves Afro hair, he loves the texture and he never tries to change it or work against it. He'll think really careful how it curls and how to cut it... making sure it's not too wet, keeping shrinkage in mind. He's got really great insight. I don't care for the hairstylists that make you feel like 'ooh, this is going to be hard work', especially the stylists in England, a lot of Black stylists in England are really loathsome to Afro hair and make you feel there's something wrong with you if you're not relaxed, or they'll say things like, 'if you ever straightened it, imagine how long it would be', but I'm like, 'I don't want straight hair'. So yes, Kenna is very good and likes to work with texture and I appreciate that. The woman that does my hair in New York is from the salon Eva Scrivo. And she does the same... puts it in the plaits and dries it. But for the pieces that don't go curly enough, she'll wind them around the iron. But that thing with doing your whole head with an iron and looking like Orphan Annie... I don't like that. I use an Aveda shampoo called Shampure. I find that it's nice. When I wash my hair, I tend to only really wash the roots. I spoke to someone that said when you have long hair, remember that the hair on the ends has been washed so many times because it's 4 years old, and when you wash your hair all you should focus on is the product build up at the scalp and to keep your scalp from feeling itchy or whatever. So when I wash my hair, I just put the shampoo at my roots, and move it around gently... I don't really mush it, I don't want to disturb the curls too much. If I'm doing my hair and I just washed it 4 days ago, I won't wash it with shampoo at all. I'd just put water in it and then just use conditioner. If it feels like it needs cleaning, which is every 8 or 9 days, then I'll use that shampoo and then I'd wash it out and put conditioner in it. There are two different conditioners that I use, one is by Aveda called Damage Remedy. I hate the name of it, because I don't like to think my hair is damaged, but it does need the moisture. And there's also a conditioner that I get from Eva Scrivo called Ruhua . Sometimes, to help it stretch, I mix it with another conditioner because it's expensive. But it's really nice because it has honey in it. So, I just put conditioner on my hair, then detangle with the big paddle brush I got from Aveda. The bristles or spines on the brush are very flexible so it may not get the knots out the first or even the second time...I spend a while detangling. If I'm brushing my hair out, I'll watch TV, or go and sit in the garden... it takes me 45 minutes, but I'm patient. The key is to not get frustrated and know that all those tangles are going to come out eventually. I detangle from the ends up and I naturally divide it into sections as I go. Once it's fully detangled, I'll put a shower cap on my head and leave it for a couple of hours. When I take it off, my hair is really black and shiny, and it's still soaking wet even though much of the conditioner is gone. But it's still easy to comb through. And then I'll just put it in the plaits. I do this styling process every 9 to 10 days. I usually just leave it. I try to position it so that it's up and over the pillow so that I don't smoosh or flatten the curls. I don't fuss too much with it and I'm not afraid of having wild hair. This is Rock & Roll... all of my hair idols, people like Yoko Ono, Grace Covington, and Janice Joplin, have this awesome big, messy hair. I love their hair! I'm not looking for it to be perfect, I like the cycle it goes through, from being wet and sort of polished looking and then it dries and gets bigger and bigger. If there are sections that look a bit messy, I will section it out, put conditioner in it and put another plait there. So I think of it like a work in progress. But on most days, I just wake up and it just looks like it looks. You don't have to to do it that day. I find that it's quite low maintenance compared to relaxed hair because you don't have to do it everyday. Sometimes, at night, I do apply an oil to my dry ends, but I can't remember the name of it. It nourishes and adds shine. But you know what, I have stages where I just put Vaseline in my hair if it's dry. I put the Vaseline in it and comb it through. I remember after using it for a while, I went to my hairdresser and she said, 'your hair is in really good condition, what have you been using?' and I told her! She couldn't believe it. I like to put essential oil in it and it gives it a really nice smell. It's cheap and I think that's a myth... that you have to use really expensive products and you don't. You can add stuff like Olive Oil, Almond oil or things you just find in the health food store to help expensive products last longer. Experiment is what I say. What works for one person may not work for you. Everyone was raving to me about Moroccan Oil but I found it way too drying. I haven't always had such a regimen, but I can say that you have to get your hair cut reasonably often. I get my hair cut about 3 times a year... Kenna does it. Find a hairstylist to trim those ends. I have so many friends that say, 'oh, my hair won't grow'. But of course, every one's hair grows, what happens is the ends break cause they get dry, they split into two and you put tension on the last few inches and they pop off. And people think 'I want to grow my hair so I'm not going to get it cut', but it's the opposite. If you're going to grow your hair, you need to get it trimmed, even if it's the tiniest bit, just so you stop the ends from breaking. Obviously eating well and drinking water helps. It's also a myth that Afro hair can't grow long and it can. You just have to give it time, plus it's growing in a spiral and it's takes a bit to show length. I want to grow mine longer! At the moment I'm writing an album. I'm really enjoying it, the process. It won't be out until next year. Today, I'm just here at home playing my guitar and relaxing. I was at Fashion Week in November and I'll probably pop back over in February. At this time, I just feel like I want to engage with creative people and I'd like to do different collaborations with people that aren't necessarily musicians. It's fun and inspiring to talk to other creative people. I really like that website Lecoil. I think she has some really good pictures on there and it's really inspiring as well. The thing I found most depressing about that Chris Rock documentary Good Hair was that lawyer. She had this very beautiful afro and the other black girls were like, 'I think your hair is cute and all but when you become a lawyer no one is going to take you seriously because of your hair', and she was like, 'yeah I know I'm going to have to change it when I become a lawyer'. So, so sad. So the thing I love about Lecoil is that when you click on a picture, you find that this person is the CEO of a company, or a journalist, or the creator of a website! I think it's really important to show more and more people in influential positions that just let their hair be. Believe it or not, at one point I wanted to start a natural hair site. Naturally, I came across your site and Lecoil... it was like 2 years ago and I was researching it and I felt that there were already enough sites and that people were doing a good job. I didn't think I needed to get into that arena, but we'll see what the future brings! Thanks Nikki! Awesome interview! 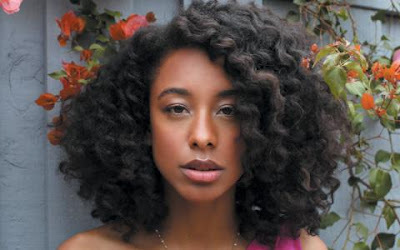 I love Corinne Bailey Rae, she has amazing hair and an amazing attitude. I love the style she gets from just 4 braids. I love Corinne Bailey Rae. She is my musical, fashion, and hair inspiration. I love her music and her hair. Totally my hair idol. I think it's so awesome that you scored an interview with her!!! Has anyone used the Damage Remedy conditioner as a styler?? I STAN FOR CORINNE!!! She has always been and will remain my ultimate hair idol. I love that she really has a relationship with her hair, which is not the norm for lots of celebs. I saw her live in concert when she came to LA last year -- her music, style, and spirit are all so enchanting. What a beautiful soul! Great interview, Nikki! I love her. her hair is gorgeous as is she. Wow, wow, wow! I totally love this woman's musics, hairstyle, and view on life. Thank you sor much for interviewing her! Wow! Amazing! Fantastic interview Nikki! Best interview ever! This lady is so down to earth, i feel like you can just hang out with her and she would just be chill. I love that she does her hair and knows her hair. Great Job Nikki. I love this interview and how down to earth she seems. Fab - U -lUSH!! I love her music and her Tresses! She is in my fotki album as one of my hair idols, I love her hair! Great Interview! she is wonderful! and so graceful in her interview! thank you nikki for tracking her down! LOVE IT!!!! I have been lusting after her hair in that second pic all year and did a post a while back about if you could trade hair for one day with one person, who would it be? Corinne was my choice!!! How unbelievable that she was using Vaseline to seal her hair! But hey, it makes sense ... though I still don't think that I would go there;). Great interview! awww! yeaaah! for the corinne bailey interview! She has mad gorgeous hair. She has been a hair idol of mine for years. I am so pleased that she was so enthusiastic to give hair care information. I love her! And I find it so endearing that her regimen is almost identical to mine! Great interview! Her routine is so simple and her hair is SO gorgeous! I can't believe she get's all of THAT out of 4 braids!!! Gorgeous head of hair!!! Yay! Corinne!!! Great interview. Keep up the good work, Nik. absorbs well. I've used her regimine for my daughters hair and it works pretty well for her. Also.....love Corinne and her music. Geez I love her! Music, her, and all. SCORE!!!!! I LURVE her! Hair. Style. Music. This was a great interview. Way to go Nikki! This has to be my favorite interview you've done, Nikki! I love her and her music and I've always looked up to her hair for inspiration. The promo pics from her last album were my background for a while and gave me inspiration to try to wear my hair big. And it worked! I actually used a picture of her hair to finally persuade my mother to let me go natural. It was around the same time in my life too! Best decision I ever made! This just really made my night!! <3 her!!! This is my absolute favorite interview ever!!! Great interview! Her hair is adorably beautiful and awesome! gahh!! i love your hair so much!! it was your hair from the first album (which i can play straight through without skipping a song) that i first thought about going natural, then when you came out with The Sea your hair was just amazing and it confirmed it! so glad you were featured...there can never be too many natural hair care sites...maybe it would push girls like the teenager featured in good hair feel confident in her look :). love your style too :). Girl get your record (um hair) on. Love her music and hair. To answer the question Nikki, I used damage ready. It's a natural protein conditioner and made my hair quite soft. However, I found Aveda's products to be somewhat expensive, so now I get the same results with Giovanni Nutrafix. I also follow up with a DC, mixing in 1 tbsp each of honey and olive oil. Wow! Nikki, thanks for landing an interview with Corinne Bailey Rae! I love her hair and now I know how she achieves most of her looks. Who would have thought that her hair regimen was so simple? I guess low manipulation hair styles are really the way to go! That interview was all kinds of awesome. And the next time I'm in London I'm gonna pay a visit to Kennaland. Thanks, Nikki! Love love love her, her advice and her hair. Nikki you are doing the dang on thing girl. This interview was stella and Corinne looks stunning. Fantastic Interview... Lurve her music and her hair! So glad she put us onto some great stylists, used the term Afro-textured and not black hair or African-American (pet peeve lol), and she looks gawjus in those shots. P.S. typo: it's Emeli Sandé ..check out her song 'Heaven' for a great 90's vibe!!! She is so down to earth. I love that she was so willing to share her routine. Gorgeous hair!! Wow! That Last pic with her hair there...AMAZING! Who knew Corinne was so funny! I LOVE HER!!!! ADORE HER TO PIECES!! YES IT HAD TO BE TYPED IN CAPS LOCK! Corinne's hair is fantastic and she's representing the UK- bonus! :) I will be trying everything mentioned in this interview- from the 4 braid technique to the Vaseline, lol! I love love LOVE everything about Corinne! Always did, and especially do now. I really wish only good things for her, she just comes across as SUCH a lovely person! And of course, that HAIR!!! thank you so much for this it was very inspiring!!! Amazing interview! And she gave such good answers. LOVE Corrine Bailey Rae. A CAH BELIEVE U INTERVIEWED CORINNE!!!!!!!! aside from the fact that she is my all time favorite singer...her hair has definitely been my inspiration many MANY a times....bloody Goddess you are Ms Bailey Rae !!! So I tried her 4 braid technique Sunday and I LOVE it!! It's much easier and quicker to do than braid-outs that require more braids and it's sooo pretty and fluffy just like hers! She's one of my hair idols and I'm so glad she shared her technique! Love her and her hair ! This is actually the first celebrity interview I really like.. Because she actually DOES her hair and has tips that work on her and was willing to share them. I also like the fact, she did acknowledge that caring for afro-textured hair takes time (specially the detangling part) but didn't take it as something frustrating. I like her attitude about her hair and love the hair. That girl makes my heart smile. She is my only true hair-idol, mainly because she started with hair texture like mine (2006-ish), but in a cute pixie-like style with ringlets (ringlets = my FAVE); and now, she's got hair in huge waves down to her mid-back (2012) and still hasn't done anything to alter her natural texture (like relaxers, texturizers, etc). It's phenomenal what loving your hair can do for it in only 6 years! She's so pretty. I agree with what she said about some -- not all -- black stylists. Some don't appreciate African-textured hair. As a result haven't learned to work with it. I'd like to think those stylists are in the minority. There are hundreds of black stylists who are doing great work with natural hair.